Just as the production line of British jukebox musicals seems to be running out of steam, here's a sharp new show inspired by '60s mod culture. Carol Harrison's musical is a peppy journey through the career of 1960s pop group 'The Small Faces', and the East End working class youth culture that surrounded them. These four sharp-suited, Vespa-riding 'faces' became local heroes for their music - and snappy dress sense. But according to Harrison's musical, which is endorsed by several former group members, their ride to stardom was beset by corruption, betrayal and tragedy. 'All or Nothing' is transferring to Ambassador's Theatre after opening at Arts Theatre, following a national tour. It's written by, directed by and stars Carol Harrison (of 'Eastenders' fame), alongside fellow telly regular Chris Simmons. I went to this play assuming it would be very similar to the Kinks musical Sunny Afternoon. If the rough idea of following a mod band through their rise to fame and fall was similar, the execution of both shows couldn’t have been less alike. All or Nothing felt like someone had given a little budget to some amateurs and dared them to make a play out of it. Although the ‘gig’ parts of the show were really entertaining, the acting was really, really poor throughout the whole cast, the dialogues embarrassing at times and the lighting very disturbing as they blinded the audience. I frankly wouldn’t bother if I were you. Fantastic night watching The Mod Musical All or Nothing! As a huge Small Faces fan, I will admit that I was a bit worried how their story and music would work as a musical. But it works wonderfully! The cast were brilliant and were spot on with their performances! The venue is great and there's a really cool display of Mod memorabilia and vintage music posters that are always so interesting to have a read of! If this doesn't make it in to the west end then its a crime against musical history! stained reputation. Odd then, that a musical has been made about them, as the target audience must be somewhat limited No surprises, poor script (Marriott's life was unremarkable), airplaying on the guitar and you wonder where the talent went - though Chris Simmons as Marriott had a good,powerful voice and was for me, the show's salvation. Strangely, I wasn't too bored. Some of the songs actually sounded very good. All or Nothing is a refreshing take on a musical but a funny one at that. If you enjoy the era of the 60s and 70s you will undoubtedly enjoy this show as it has great outfits, amazing live music and an aura of cool about it. I was a bit worried when the ‘drunken’ narrator opened the show but his part soon helped propel the show and give a clever bit of background to the band it was about, The Small Faces...needed if you’re not up to scratch with your knowledge of 60s mod bands. What I loved most about it was the fact the music was live and right in front of you instead of being hidden underneath the stage. The cast are obviously very talented musicians and I feel it would have made for a better show if there was more playing and less dodgy acting. I wasn’t a fan of the parent roles and didn’t think they needed to be played out as much as they were. Whoever was in charge of the lights also needs to take it down a peg or two as I nearly got blinded a few times sitting in the upper circle seats! By the end of the show you’ll be singing along to the tunes whether you knew them or not, probably one to see if you’re a general music fan as the voices and music are great. What a bonkers night I had with the All or Nothing Mod Musical at the Ambassadors Theatre. I enjoyed myself, but I probably wouldn’t go and see it again. It was quite fabulous to go back and relive the crazy, flashy 1960s. All or Nothing The Mod Musical is funny, quirky and mad, but I have to admit that it’s not my type of musical. I did like the twist on the Mod culture of the rocky 1960s. The Mod era was a tough one and so much happened in that decade. The musical is about the journey of the 60s music group called the Small Faces. Their journey turned out to be full of unexpected events. It must of been a messy decade indeed. 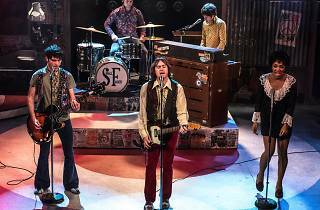 The actors who reinterpret the life and the music of the Small Faces are bang on, but lacks a certain something. The story is told amusingly well and the music is recreated flawlessly. The cast are great and absolutely hilarious, but once again a certain quality is missed. It’s the not best acting I’ve seen, but if I’m thinking about the era of the Mods, the messy, swinging sixties, then I think it’s probably acceptable. Chris Simmons who plays as the narrator of his story is average. Carol Harrison is nutty and insane. She definitely made me laugh. If I have to pick one person who stood out for me, that person was Karis Anderson. Her presence and her voice is phenomenal. Her vocals were on point. I also just realised that evening that she is from a well known band that I love called Stooshe. Very surprised and completely unaware. If you’re ever thinking of traveling back to the 60s or you just love music, then this is the musical for you. Relive the era of the Mods and have a bloody good time. Having gone with a musical theatre student, we used the intermission and post-show tube walk to discuss the elements we didn't like. The costumes were great, perfect representation of the time and the singing was very good especially the young female singer. Everything else was dated, un-cool and a boring representation of an incredible movement within fashion and music. The story had no depth and didn't help bring the characters to life in any way. Having such a prominent story teller would be worth it if the scenes were being set, but somehow all the dialogue felt unnecessary. The cast would almost be better as a tribute band. The entire cast were brilliant, with Chris Simmons drunken narrative taking the crown. The band created the perfect tribute, and delivered a powerful narrative of not only Small Faces, but the Mod culture as well as the 60s. Definitely worth a go for all generations! I want to start out by saying I was not familiar with the band Small Faces, and still enjoyed the show and found the songs stuck in my head the next day! If you grew up in the 60s, or are a fan of Small Faces, I am sure you will love show (and if you're like me you'll still enjoy it!). The band did an amazing job of bringing the band of making the audience feel like they were at a gig. I don't think there was a single person that wasn't tapping their feet, clapping their hands, or dancing by the time the curtain went down. All or Nothing was a fantastic tribute to the band, and did a great job of not only telling the story of the Mod band but bringing a bit of the 60s alive in the cosy Ambassador theatre. Pretty much the same rising to fame story as every other bad, so not super exciting there. The music and instrument playing was really good. The acting - over acted by some and under acted by others. If you’re a particular fan of the small faces then maybe this would be more for you, but it didn’t win me over. Brilliant tribute to the Small faces and Mod Culture. If you’re a fan or grew up in the 60’s I can imagine this would be a truly brilliant night, which was evident from the pockets of crowds up dancing and singing along at the end. I however wasn’t particularly familiar with the band so was hoping for a bit of a history lesson along with being entertained. Unfortunately, I feel the story didn’t quite deliver this, it felt a little one dimensional and the performance at times felt a little amateur. That being said the actual song performances were great and they put on a brilliant gig! It does also have some brilliant laugh out loud liners and Chris Simmons narration and gradual drunken state is fantastic! Thoroughly enjoyed from minute to end - great cast and an amazing portrayal for the story of the Small Faces. Theatre is nice and cosy, not a huge one like some of the larger West End shows. The location is ideal as well as it's super easy for grabbing some pre (or post) food/drinks. The cast are superb at getting you singing along at the end. Would highly recommend to any Small Faces or Mod fans! Even if you're not, you can't help but enjoy yourself at this show. But the trains rumbling overhead only add to the atmosphere of this brutally real telling of Steve Marriott and The Small Faces. The storyline takes in many highs and serious lows - with a tight script and simply awesome live music. Just like Sunny Afternoon, this is a must see if you are heading to London and you want a musical that has real heart and not too much sugar. Very impressed by All or Nothing , The Mod Musical. It feels so authentic at The Vaults tucked beneath Waterloo. The bar area has a great display of memorabilia , and the theatre space is adorned with posters of gigs I wish I had attended. 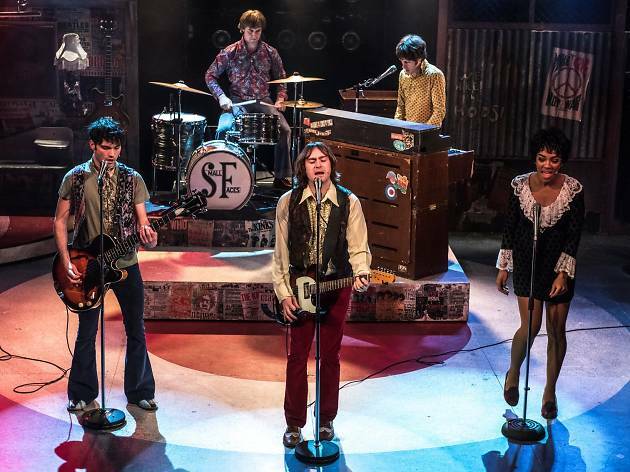 The show charts the incredible highs and lows of Steve Marriott and The Small Faces.